Spring is finally here and I’ve been waiting! Winter has been long this year. It’s not that it’s been extremely cold, it’s more that it gets cold, we get a foot of snow, it warms up to 50 degrees and is sunny, then it gets really cold again. It’s been quite the roller coaster ride this winter and I just want it to be warm and sunny. In order to celebrate the fact that spring is finally here I made a Welcome Spring Anti-gravity Drip Cake. Try saying that five times fast. This cake not only screams spring it has two cake techniques that are currently all the rage. Let’s talk about the drip cake first. I made my first drip cake several months ago after seeing them all over Food Network on the cake and baking shows. I knew it was a huge trend and I had to try it out. I’ve been using a squeeze bottle which makes it a whole lot easier. While it isn’t a hard technique, I still haven’t perfected it so my drips aren’t perfect but it is a fun way to decorate a cake. 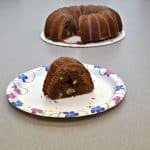 The second technique is the anti-gravity cake. I first saw this one on Kids Spring Baking Championship. Have you watched any of those shows? The kids are crazy talented! They had to make a cake that had an anti-gravity decoration on top and I was amazed. I thought it would be fun to use this type of decoration in my spring cake. The cake itself is lightly flavored with Adams Extract Lemon Extract. I like to use extract in the cake because I feel like it flavors it more than lemon juice does. I baked up two layers and then let them cool. While they were cooling I made a batch of Lemon Buttercream Frosting using the Adams Lemon Extract as well as Adams Extract Natural Yellow Food Coloring. It turned the frosting a pale yellow color that is perfect for spring. Once I frosted the cake I quickly pressed Sprinkle Pop Cottontail Confetti sprinkles along the bottom inch of the cake. I love doing this because my frosting of the cake on the bottom edge doesn’t have to be perfect because the sprinkles cover it up. It also makes a really cool border. The Cottontail Confetti is mostly pastel green sprinkles that look like grass with some pastel egg confetti mixed it. It’s perfect for spring or Easter. Next up I had to make the drips. 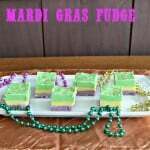 I used pink candy melts for this and loved the color against the yellow frosting. Then it was time for the anti-gravity decoration. It wasn’t that it was hard to make, it just took multiple steps to make it. I had to find an empty sprinkles bottle, a paper straw, candy melts, and more sprinkles. I used Sprinkle Pop Egg Hunt Sprinkle Mix because it was so colorful. It has pastel sprinkles and balls along with royal icing bunnies and carrots! I was so nervous putting the anti-gravity on top of the cake but it worked perfectly and looked amazing! I have to admit, I was pretty proud of myself. I then sprinkled a handful of the Egg Hunt Sprinkles on top of the cake and realized I needed a border on the top. I took the remaining buttercream frosting, used Adams Extract Natural Green Food Coloring, and piped on a quick border. This cake looked so awesome. 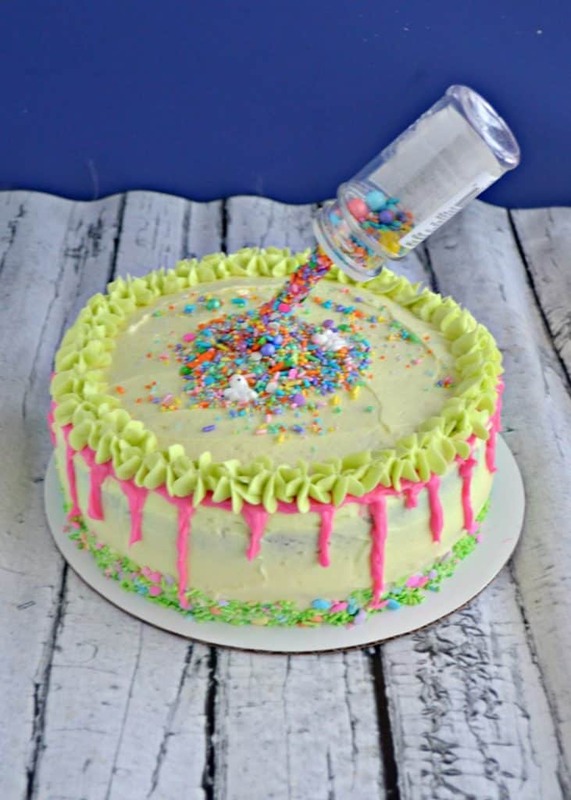 Bright pink drips down the side, pastel green sprinkle grass at the bottom, a pale yellow frosting, pale green top border, and the anti-gravity sprinkles flowing down were so cool! I took this cake to work and even though most of my building is on a diet the cake was gone quickly. I also had a lot of compliments on how fun this cake was. As for the flavor, the cake was lightly lemon flavored. The frosting had a heavier concentration of lemon flavor but it wasn’t overbearing. The cake was firm but not dry. The sprinkles added additional flavor. My toddler liked the candy melt drips the best. Overall this was a fun cake to make and I’d be happy to make it again. The entire thing took me a little over two hours to make which isn’t too bad considering how many different components are in this cake. So if you are looking for a way to welcome spring, give this cake a try! A delicious lemon cake topped with fluffy lemon frosting the topped with a pink candy drip and anti-gravity sprinkle topper as well as sprinkle decorations. Preheat the oven to 350 degrees. Spray and flour two 8" round cake pans. Set aside. In a medium bowl combine the flour, baking soda, baking powder, and salt. Mix well in set aside. In a large bowl cream together the butter and sugar until it is smooth. Add in the eggs and lemon extract and mix well. Add half the flour mixture to the butter mixture and mix until combined. Add in the milk and mix well. Add the remaining flour and mix until just combined. Divide the batter in half and pour half into each prepared pan. Bake for 35 minutes. Remove from oven and allow to cool 10 or 15 minutes. Run a butter knife around the edge of the cake and remove from pan. Cool completely on a wire rack. To make the frosting place the butter in a large bowl. Beat with a mixer on medium high speed until smooth. Add in the powdered sugar a half cup at a time until desired consistency is reached. Add in the lemon extract and yellow food coloring and mix well. Place one cake layer on a cake round. Spread 1 cup of frosting on top of the cake and smooth. Place the second cake layer on top of that. 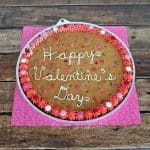 Reserve 1 cup of the remaining frosting then use the rest to frost the top and sides of the cake. To make the drip place the candy melts and coconut oil in a microwave safe dish and microwave in 20 second increments, stirring after each heating, until completely melted. Put the candy melts into a squirt bottle. 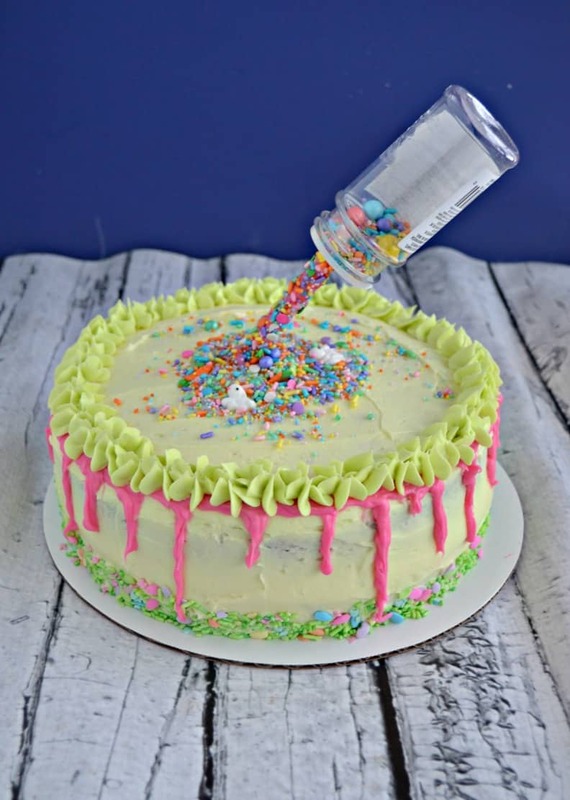 To make the drip squeeze the bottle around the top edge of the cake and allow the candy to drip down the cake every inch or so. The drips should be different lengths. Squeeze remaining candy melts around the top edge of the cake. To make the anti-gravity sprinkles melt the pink candy melts in the microwave in 15 second increments, stirring after each heating, until melted. Place the candy melts about 1 inch fromt he top of the paper straw to about halfway down. Sprinkle the candy melts with the Egg Hunt Sprinkle Mixture. Stick in the freezer to harden. To make it look more real put more pink candy on the bottom portion of the candy to thicken it and sprinkle it with the Egg Hunt Sprinkle Mix. Freeze for 1 minute. Stick the 1 inch top piece of the straw into a hole in the empty sprinkles container. Tape the remaining holes shut. Place 1-2 tablespoons of the Egg Hunt sprinkle mixture in the empty bottle and put on the cap with holes in it. 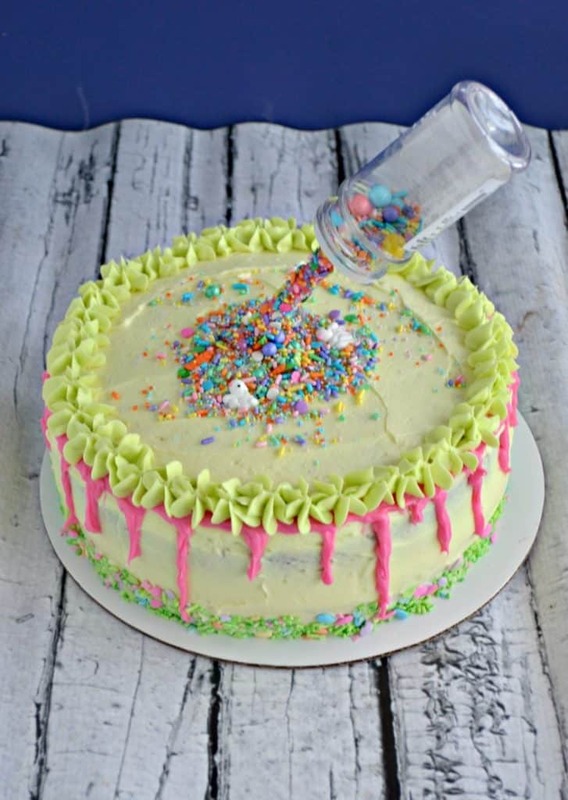 Stick the other end (it should be half of the straw with nothing on it) into the cake at an angle so it looks like the sprinkles are flowing down onto the cake. 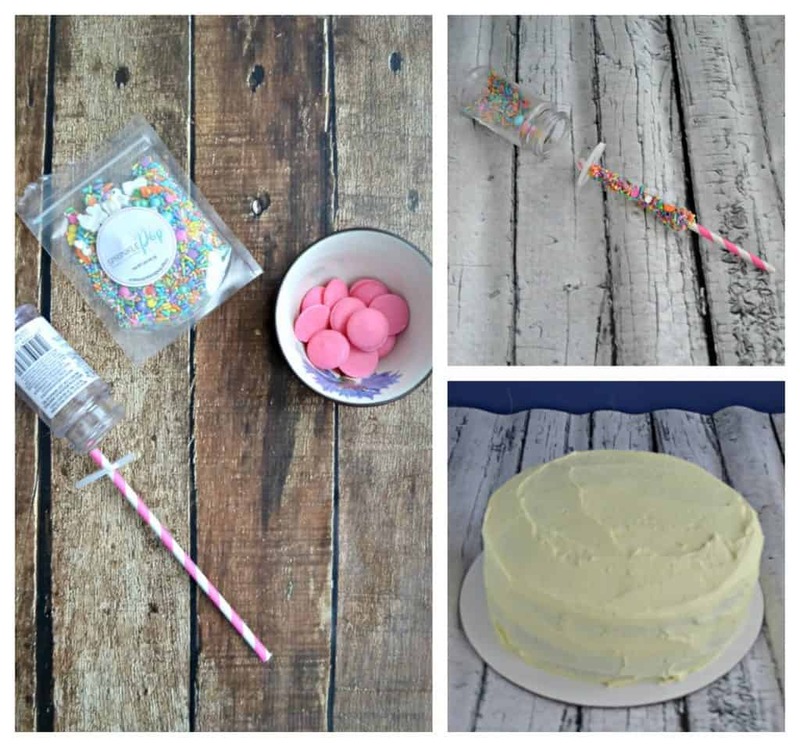 Sprinkle a few tablespoons of the Egg Hunt Sprinkles in the middle of the cake around the sprinkled straw. Add green food coloring to the reserved frosting. Pipe it around the top edge of the cake. Don’t forget to enter to win one of 8 amazing prize packages! It looks so beautiful and it will be yummy also. This is a fun and yummy cake! I haven’t tried to make a drip cake yet…scared too lol. I love the use of the Adams in this too…love their lemon extract. Very creative and fun, thanks for giving us all the details about how you made it and the time it took, that is super helpful! I’ve been waiting for you to post this one!! It is such a fun cake and I love the anti-gravity effect with the sprinkles. So fun! Such a fun, festive cake! Love how you did the anti-gravity feature! What an awesome idea! This turned out really cool. I especially like the Spring colors and the cute sprinkles. This is so impressive! I love how it looks! Such a clever idea. I love this cake and my Angel Face would be thrilled with it. Seriously this is amazing! I love the flavor of the cake as well as the creativity! This is sooooo clever! I’m beyond impressed! I don’t think I’d every be able to pull this off. This looks just too cool!! I never would have thought of something like this. Can’t wait to try it, though! What a fun cake! 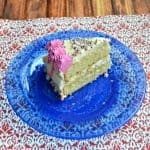 My favorite spring sweet is a lemon blueberry cake with lemon buttercream! I LOVE how your cake turned out, it definitely has that “wow” factor. I need to add drippy cakes and anti-gravity toppers to my try-it list. They look like a lot of fun!